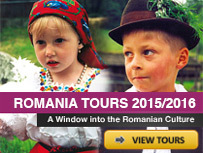 Romania climate is temperate-continental with full of snow winters and hot summers. It is a travel destination all year round. Most head for Romania, Bucovina and Maramures during the relatively warm months, between April and September, or during the winter holidays when it’s covered in snow. In April or even in May it is best to take an extra sweater with you, because the weather can be windy, with temperatures around 9-15° C. The summers can be very hot, but usually the temperatures are lower in Bucovina and Maramures than in other parts of Romania, due to the mountains and hills. At this time of the year all the monasteries are full of flowers in bloom. Even the autumn months could be a good time to travel to enjoy the turning colours of the wooded hills. During winter the cold can be quite intense, especially in the northern part of Bucovina, so you should come prepared. If you plan your trip by yourself and you want to go during the high season, it is better to book the hotel rooms two or even three months before your arrival.